Another Trewithen Gardens’ volunteer has won a coveted placement on a nationally recognised horticultural course. 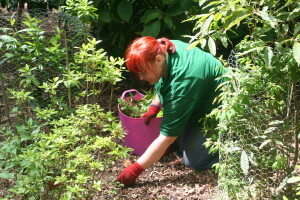 Nicola Johnson has been accepted on the Professional Gardeners Guild Traineeship – a three year placement in three gardens with on the job training and professional career development. It’s the third time in as many years that a volunteer has been so inspired by the garden and its Head Gardener Gary Long that they have progressed from volunteer gardening to a career in horticulture. Scarlett English is currently at Kew Gardens completing a three year diploma and Inez Williams was inspired by her Trewithen experiences to take an honours degree in Landscape Design. She used Trewithen as a subject for her dissertation and was awarded a first. Inez is now studying for a Masters degree at Bath University in Conservation Landscape with the full intention of making a career out of garden restoration. Nicola joined Trewithen’s invaluable team of volunteers less than a year ago. She had worked at Penair School in student support, but left the job to begin a horticulture course at Duchy College, Rosewarne. Within weeks of starting that course she discovered she needed practical experience to complement her studies. Nicola joined the Trewithen team a few days later. By February she too had been inspired by her experiences and began to research horticultural training opportunities. Gary is now looking for more volunteers.